John Bell was born in Belfast, Northern Ireland. Both sides of his family were of Ulster Scots roots. 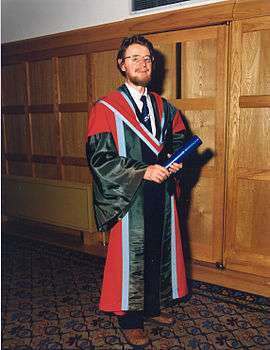 When he was 11 years old, he decided to be a scientist, and at 16 graduated from Belfast Technical High School. Bell then attended the Queen's University of Belfast, and obtained a bachelor's degree in experimental physics in 1948, and one in mathematical physics a year later. He went on to complete a Ph.D. in physics at the University of Birmingham in 1956, specialising in nuclear physics and quantum field theory. In 1954, he married Mary Ross, also a physicist, whom he had met while working on accelerator physics at Malvern, UK. Bell became a vegetarian in his teen years. According to his wife, Bell was an atheist. Bell's career began with the UK Atomic Energy Research Establishment, near Harwell, Oxfordshire, known as AERE or Harwell Laboratory. After several years he moved to work for the European Organization for Nuclear Research (CERN, Conseil Européen pour la Recherche Nucléaire), in Geneva, Switzerland. There he worked almost exclusively on theoretical particle physics and on accelerator design, but found time to pursue a major avocation, investigating the foundations of quantum theory. He was elected a Foreign Honorary Member of the American Academy of Arts and Sciences in 1987. Also of significance during his career, Bell, together with John Bradbury Sykes, M. J. Kearsley, and W. H. Reid, translated several volumes of the ten-volume Course of Theoretical Physics of Lev Landau and Evgeny Lifshitz, making these works available to an English-speaking audience in translation, all of which remain in print. Bell was a proponent of pilot wave theory. In 1964, after a year's leave from CERN that he spent at Stanford University, the University of Wisconsin–Madison and Brandeis University, he wrote a paper entitled "On the Einstein-Podolsky-Rosen Paradox". In this work, he showed that carrying forward EPR's analysis permits one to derive the famous Bell's theorem. The resultant inequality, derived from certain assumptions, is violated by quantum theory. There is some disagreement regarding what Bell's inequality—in conjunction with the EPR analysis—can be said to imply. Bell held that not only local hidden variables, but any and all local theoretical explanations must conflict with the predictions of quantum theory: "It is known that with Bohm's example of EPR correlations, involving particles with spin, there is an irreducible nonlocality." According to an alternative interpretation, not all local theories in general, but only local hidden variables theories (or "local realist" theories) have shown to be incompatible with the predictions of quantum theory. A possibility is that we find exactly where the boundary lies. More plausible to me is that we will find that there is no boundary. ... The wave functions would prove to be a provisional or incomplete description of the quantum-mechanical part, of which an objective account would become possible. It is this possibility, of a homogeneous account of the world, which is for me the chief motivation of the study of the so-called 'hidden variable' possibility. For the good books known to me are not much concerned with physical precision. This is clear already from their vocabulary. Here are some words which, however legitimate and necessary in application, have no place in a formulation with any pretension to physical precision: system, apparatus, environment, microscopic, macroscopic, reversible, irreversible, observable, information, measurement. .... On this list of bad words from good books, the worst of all is 'measurement'. But if he were to thoroughly explore the viability of Bohm's theory, Bell needed to answer the challenge of the so-called impossibility proofs against hidden variables. Bell addressed these in a paper entitled "On the Problem of Hidden Variables in Quantum Mechanics". (Bell had actually written this paper before his paper on the EPR paradox, but it did not appear until two years later, in 1966, due to publishing delays.) Here he showed that John von Neumann’s argument does not prove the impossibility of hidden variables, as it was widely claimed, due to its reliance on a physical assumption that is not valid for quantum mechanics—namely, that the probability-weighted average of the sum of observable quantities equals the sum of the average values of each of the separate observable quantities. Bell subsequently claimed, "The proof of von Neumann is not merely false but foolish!". In this same work, Bell showed that a stronger effort at such a proof (based upon Gleason's theorem) also fails to eliminate the hidden variables program. The supposed flaw in von Neumann's proof had been previously discovered by Grete Hermann in 1935, but did not become common knowledge until after it was rediscovered by Bell. However, in 2010, Jeffrey Bub published an argument that Bell (and, implicitly, Hermann) had misconstrued von Neumann's proof, claiming that it does not attempt to prove the absolute impossibility of hidden variables, and is actually not flawed, after all. (Thus, it was the physics community as a whole that had misinterpreted von Neumann's proof as applying universally.) Bub provides evidence that von Neumann understood the limits of his proof, but there is no record of von Neumann attempting to correct the near universal misinterpretation which lingered for over 30 years and exists to some extent to this day. Von Neumann's proof does not in fact apply to contextual hidden variables, as in Bohm's theory. For me, it is so reasonable to assume that the photons in those experiments carry with them programs, which have been correlated in advance, telling them how to behave. This is so rational that I think that when Einstein saw that, and the others refused to see it, he was the rational man. The other people, although history has justified them, were burying their heads in the sand. ... So for me, it is a pity that Einstein's idea doesn't work. The reasonable thing just doesn't work." It is difficult for me to believe that quantum mechanics, working very well for currently practical set-ups, will nevertheless fail badly with improvements in counter efficiency ..."
Some people continue to believe that agreement with Bell's inequalities might yet be saved. They argue that in the future much more precise experiments could reveal that one of the known loopholes, for example the so-called "fair sampling loophole", had been biasing the interpretations. Most mainstream physicists are highly skeptical about all these "loopholes", admitting their existence but continuing to believe that Bell's inequalities must fail. Bell remained interested in objective 'observer-free' quantum mechanics. He felt that at the most fundamental level, physical theories ought not to be concerned with observables, but with 'be-ables': "The beables of the theory are those elements which might correspond to elements of reality, to things which exist. Their existence does not depend on 'observation'." He remained impressed with Bohm's hidden variables as an example of such a scheme and he attacked the more subjective alternatives such as the Copenhagen interpretation. Bell died unexpectedly of a cerebral hemorrhage in Geneva in 1990. Unknown to Bell, that year he had been nominated for a Nobel Prize (which is rarely awarded posthumously). His contribution to the issues raised by EPR was significant. Some regard him as having demonstrated the failure of local realism (local hidden variables). Bell's own interpretation is that locality itself met its demise. ↑ Burke, P. G.; Percival, I. C. (1999). "John Stewart Bell. 28 July 1928 - 1 October 1990: Elected F.R.S. 1972". Biographical Memoirs of Fellows of the Royal Society. 45: 1. doi:10.1098/rsbm.1999.0001. ↑ Shimony, A.; Telegdi, V.; Veltman, M. (1991). "John S. Bell". Physics Today. 44 (8): 82. doi:10.1063/1.2810223. ↑ O'Connor, John J.; Robertson, Edmund F., "John Stewart Bell", MacTutor History of Mathematics archive, University of St Andrews . ↑ Patricia M. Byrne (February 5, 2003). "John Stewart Bell". Retrieved April 10, 2015. ↑ Aczel, A. D. (2002). Entanglement: The Greatest Mystery in Physics. Basic Books. p. 139. ISBN 978-1-56858-232-0. ↑ Bell, Mary (2016). "Bell the vegetarian". doi:10.1063/PT.3.3252. ↑ Andrew Whitaker; Mary Bell; Shan Gao (Sep 19, 2016). "1 - John Bell - The Irish Connection". Quantum Nonlocality and Reality: 50 Years of Bell's Theorem. Cambridge University Press. p. 8. ISBN 9781107104341. John Bell was certainly not interested in Protestantism as such – his wife Mary  has reported that he was an atheist most of his life. ↑ "Bell, John Stewart". Members of the Academy of Arts & Sciences, 1780–2010 (PDF). American Academy of Arts and Sciences. p. 38. Retrieved 2011-05-30. ↑ Einstein, A.; Podolsky, B.; Rosen, N. (1935). "Can Quantum-Mechanical Description of Physical Reality Be Considered Complete?". Physical Review. 47 (10): 777. doi:10.1103/PhysRev.47.777. ↑ "Faces and places: John Stewart Bell". CERN Courier. August 2014. ↑ Sutton, Christine. "Fifty years of Bell's theorem". CERN official website. CERN. ↑ von Neumann, J. (1996). Mathematical Foundations of Quantum Mechanics. Princeton University Press. ISBN 978-0-691-02893-4. ↑ Bub, J. (2010). "Von Neumann's 'No Hidden Variables' Proof: A Re-Appraisal". Foundations of Physics. 40 (9–10): 1333–1340. doi:10.1007/s10701-010-9480-9. ↑ Bernstein, J. (1991). Quantum Profiles. Princeton University Press. p. 84. ↑ Jackiw, R.; Shimony, A. (2008). "Bell, John Stewart". Complete Dictionary of Scientific Biography. Retrieved 2013-11-24. ↑ Sullivan, W. (10 October 1990). "John Stewart Bell Is Dead at 62; Physicist Tested Particle Actions". New York Times. Retrieved 2013-11-24. ↑ "Faces and things: John Stewart Bell 1928-1990". CERN Courier. 30 (8): 25. November 1990. ↑ "John Stewart Bell Prize". Centre for Quantum Information and Quantum Control. ↑ "Prof. Nicolas Gisin awarded the First Bell Prize". Centre for Quantum Information and Quantum Control. 3 August 2009. Retrieved 2013-11-24. Bell, J. S. (1988). Speakable and Unspeakable in Quantum Mechanics. Cambridge University Press. p. 14. ISBN 978-0-521-36869-8. Bell, J. S. (2004). Speakable and Unspeakable in Quantum Mechanics (2nd ed.). Cambridge University Press. ISBN 978-0-521-52338-7. 2004 edition with introduction by Alain Aspect and two additional papers: ISBN 0-521-52338-9. Pearle, P. (1970). "Hidden-Variable Example Based upon Data Rejection". Physical Review D. 2 (8): 1418–1825. Bibcode:1970PhRvD...2.1418P. doi:10.1103/PhysRevD.2.1418. Wikimedia Commons has media related to John Stewart Bell (physicist).